School Loop Plus allows integration of Partner Gradebooks. This articles provides the guideline in configuring Easy Grade Pro to work with School Loop. To use Easy Grade Pro with School Loop, you must have version 4.0 or 4.1. It is also important to note that you must start a new Gradebook following the directions mentioned in this article. Note: EGP Web, the online version of Easy Grade Pro, is NOT compatible with School Loop. 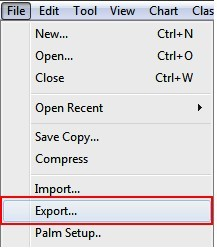 Enable the XML export format in the Easy Grade Pro (EGP) application, which is disabled by default. Note: An XML export from EGP is required for integration with School Loop. Users should check that XML exports are supported in future versions of EGP before upgrading. Hover the pointer over the File menu. Click and hold the left mouse button down. Hover the pointer over the Export... option and release the left mouse button. Then click the Export... option. Export Rosters from School Loop. On your portal click More at the right of the course to reveal additional links and click Roster Tools. Click the Roster (.txt) link to download your roster for a period in a text file. Create a folder for your Gradebook files on your computer and save this text file. You can download files for all sections and save them in the same folder. You can also download rosters from the Partner Gradebook area in the GradeBook For... Pull-down on your navigation bar. Import rosters into EGP application. Create a name for your Gradebook and save it to a new folder on your computer. 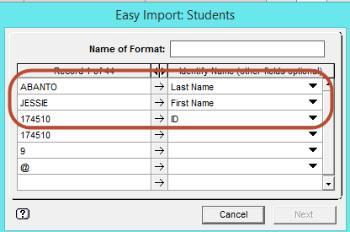 Select Import Classes then Easy Import of Students. Select a term and then type the class and the subject name in the space provided. Find your roster file in the folder you created and open it. You will be asked to match the data fields with information from the roster. Select Last Name, First Name, and ID#. You can now import the rest of the section rosters for this class into the same Gradebook. Once you have your Gradebook created, you can enter assignments and grades. When new students enroll in your class and appear on your School Loop roster, you can update your Easy Grade Pro gradebook by following the same steps you used to import rosters initially but instead of creating a new class with the updated roster, choose your Current Class. Note: Do not enter student names or change ID numbers in EGP. These will not match when you export to School Loop. 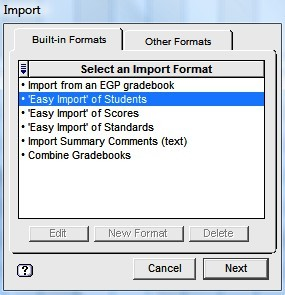 In EGP, Select the Export XML Gradebook format, then select your class and click Export. If you have more than one class in your course, Ctrl+click to select multiple classes. It is important to export all periods in a course into one export file. Save the XML file (by default the name is XML Gradebook.xml) to your EGP folder on your computer. Note: DO NOT CHANGE THE NAME OF THIS FILE. Import EGP Progress Reports into School Loop. Ensure that EGP Gradebook is selected. Refer to the article Selecting Your Gradebook for instructions. In your School Loop portal, select Partner Gradebook in the Gradebooks menu on your Navigation Bar. Choose your course, click choose file and upload your XML Gradebook.xml file. Because you have imported your rosters from School Loop and are exporting the same students back to School Loop, your progress reports will publish successfully. 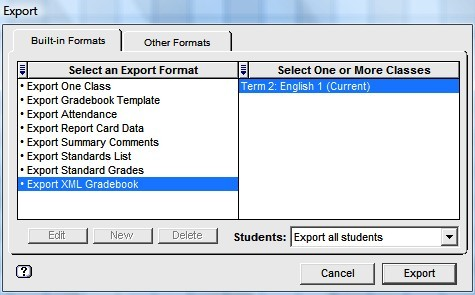 If you use Standards-based grading in Easy Grade Pro, just export from EGP and import into School Loop as instructed above and our system will automatically format the progress report to display your standard grades. To validate that the Gradebook has been integrated successfully, view the published progress reports. A convenient place to view them is from the Grade Trends page accessed from Roster Tools. From your portal, click More then click the Roster Tools link. On the Tools page, click the Grade Trends link on the right side under Performance Tools. 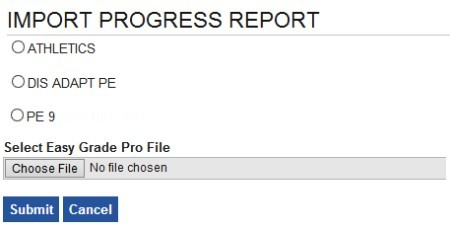 Click the arrow next to a student's name to see details including a link to the Full Progress Report. 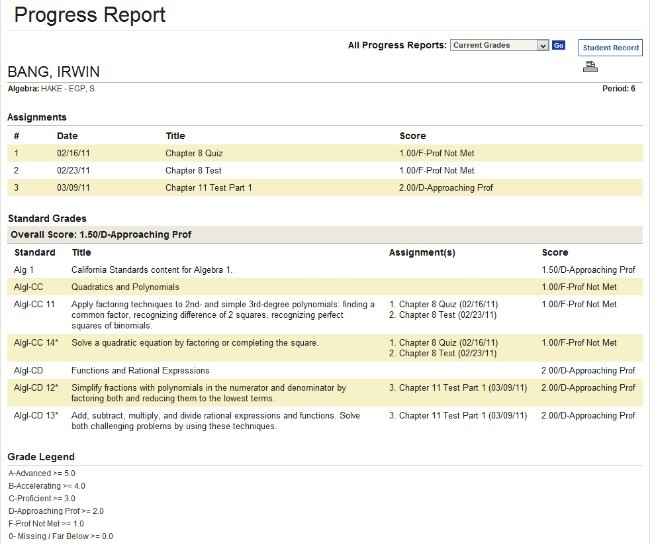 The full progress report will show the assignments and grades you have imported for that student. Note: Only the most recently published progress report will be available for students and parents. School Loop does not keep a record of older progress reports or grades when using a partner Gradebook. It is important to back up your Gradebook. Click More to reveal your Classroom links then click Reports. On the Reports page, click Unpublish to remove your latest upload. Students will see "No Grades Published".